On the bridge over the river, a large crowd is pointing cell phones at an alligator mississippiensis. The grownups giggle like kids. Londoners standing next to me admit that Paris with its Mona Lisa pales in comparison to these prehistoric beasts at Myakka River State Park. Sometimes I think the beasts are on the park payroll. 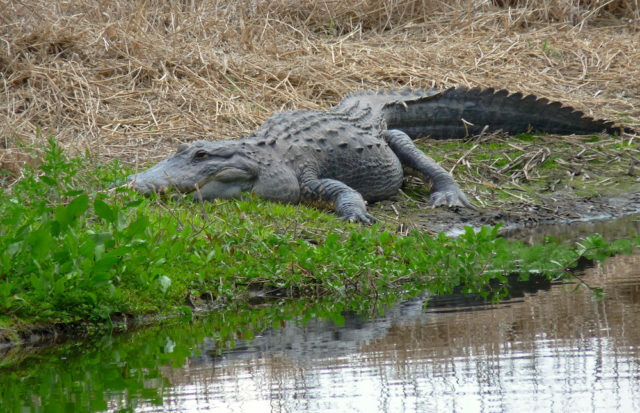 American alligators are descendants of reptiles that inhabited the planet 150 million years ago. The earlier creatures survived the huge asteroid that crashed into the Gulf of Mexico 65 million years ago, wiping out much of life on Earth, including the dinosaurs. The American alligator appeared on earth only 12 million to 6 million years ago in lands east of the Mississippi, and much later in Florida, newborn in geological terms. In the last century in Florida, the “saurian,” as they were called back then, were not far from extinction themselves. 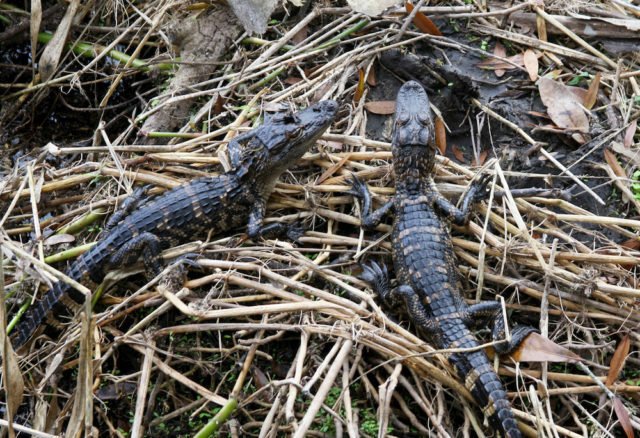 Trophy seekers lusted after alligators, which they usually bagged with a lot of help from poor blacks who — for a pittance — would do the dirty work. It was the professional hunters who decimated the populations. Remember your mother’s alligator shoes and handbag? Like snowy egrets killed for their feathers, the gators were victims of a fashion craze and exterminated by the thousands before being designated a protected species. 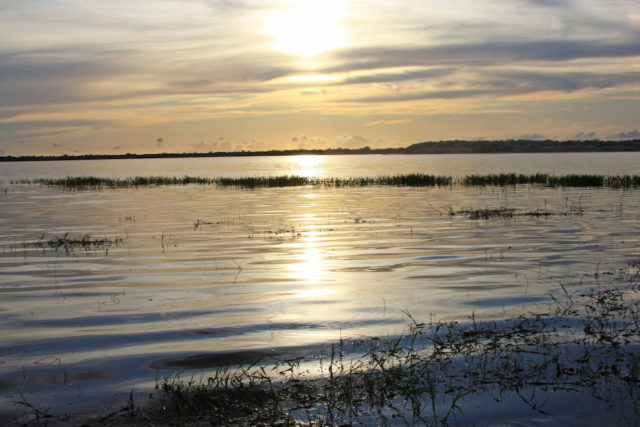 Protection brought a rebound, which canoeists and kayakers now experience in winter on Myakka’s Lower Lake. When fresh water is at a premium, that body of water gets crowded, and paddlers sometimes feel they could be snapped up, should an opportunity arise. The riverboat ride serves up alligators at a distance. Passengers watch the alligators haul up out of the river to sun themselves, providing great photo ops. Elsewhere in the park — the end of Power Line Road and the picnic areas near the concession stand are just two areas — landlubbers can experience these beautiful creatures steaming by, most of their 1,000-pound bulk concealed by water stained black with the tannin of oak leaves. For a couple of years, the Rincon Writers Group has met regularly at a picnic table on the water’s edge. Creativity soars under the beautiful palm/oak canopy as we read aloud our latest efforts while trying not to be distracted by the gorgeous anhinga atop a live oak, drying her wings; a shy limpkin fishing in the shallows; or the great blue heron who thinks he owns the place, squawking loudly as he flaps by. Alligators stop the proceedings. 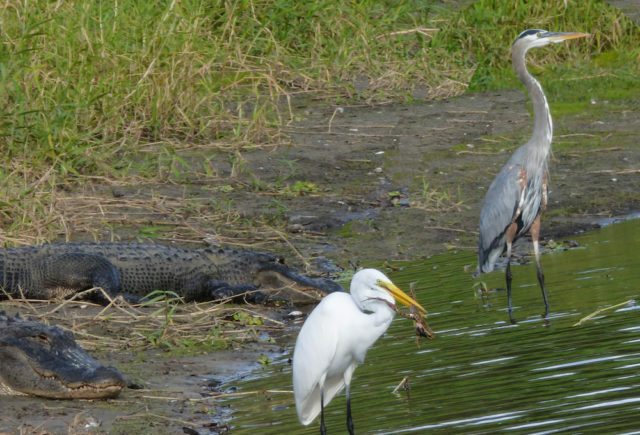 Hoping for a happy outcome, we watch a snowy egret feeding in the shallows move ever closer to a sleeping alligator. Gators are supposed to inhabit just watery places, but sometimes they turn up in the woods to surprise hikers who assume one of the creatures is just another log. I have had my own share of surprises. Years ago, when I did not know better, I moved in for a close-up of new hatchlings just out of the nest. Luckily “Mama Gator” — who can be depended upon to fiercely defend her offspring — was far enough off that I got away in time. 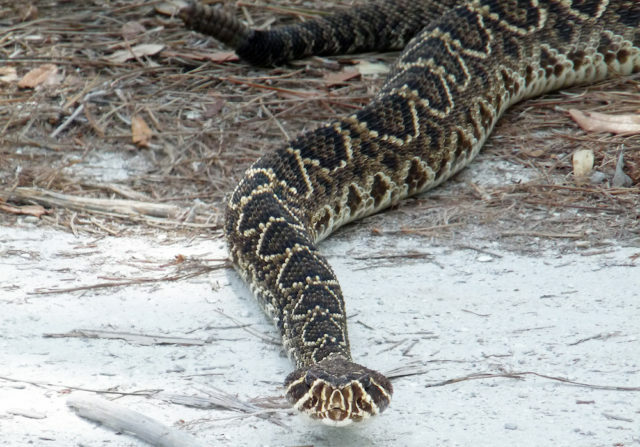 Once I found myself between an alligator and a diamondback rattlesnake at Carlton Reserve. I chose the rattlesnake when I remembered William Bartram’s description of the rattler as “magnanimous.” a word no one ever has used to describe an alligator. 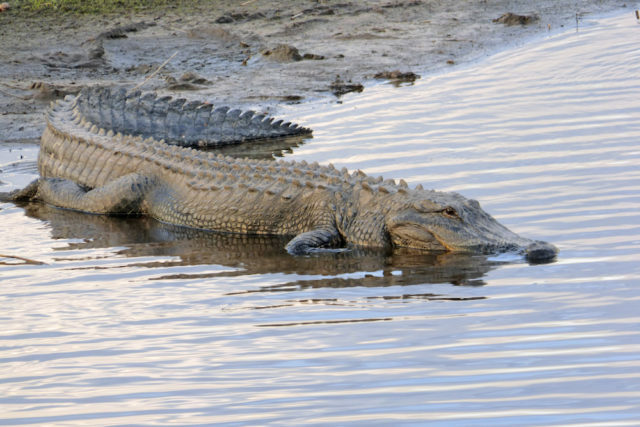 What does an alligator have in common with an elephant? Side-by-side, they could not appear to be more different. One is a carnivore; the other, an herbivore. One is a wetland species; the other, a creature of savannas. Both are keystone species, though, essential to the balanced functioning of their habitats. In the Everglades, alligators scrape out watering holes, which enables them and most of the neighborhood — herons, egrets and others — to survive months of drought. 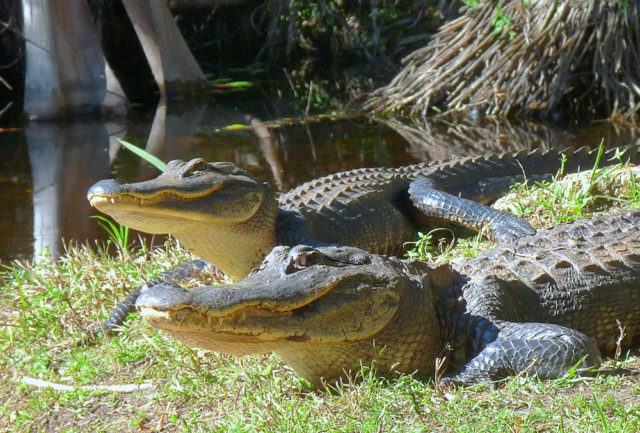 Alligators remain an endless source of fascination. 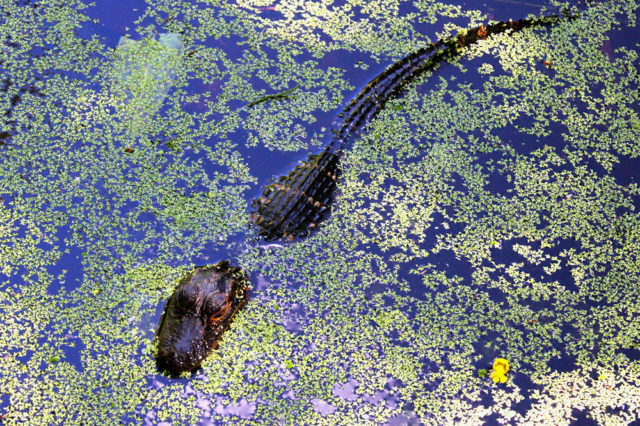 In summer, when Londoners are back home, tending their flower gardens, Floridians deal with alligators traveling far afield to show up in ditches, on golf courses and even in swimming pools. Sloshing down a trail in the rainy season, I remember to keep a sharp eye out, but in drier times I will forget them until a huge splash in a nearby ditch startles me. 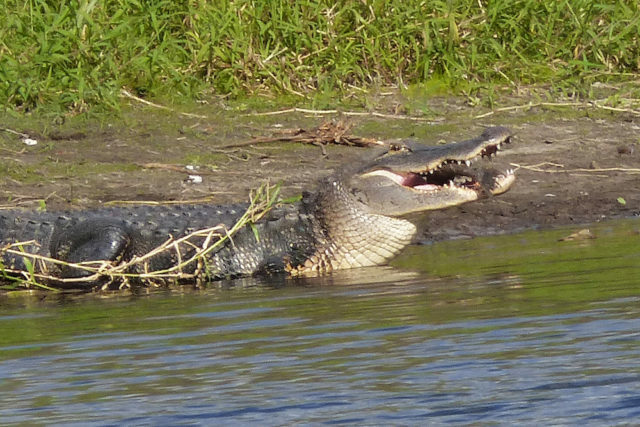 Photographing alligators is addicting, as my friend, Bonnie Samuelson, will tell you. We file away great places to see them, including the Myakka. When I leave the park at dusk, I always pause at the bridge to watch the gaggle of tourists enthralled by an alligator gobbling up a tilapia. Then he steams up the river, undeniably master of the place. May it always be so. Very fine article and photos by Fran. Glad you publish this type journalism. Tell Fran to check her history, the new Secretary of Housing says the world is only 6000 years old. Thank you, Fran! I could feel Myakka from my couch. Fantastic article and photos by Fran. I learned a lot. She is a true lover of wild life.